You might have seen TIMBERSPORTS®on YouTube before but there is nothing like the thrill of seeing it live – you’ll be hooked from the start of this logger sports spectacle! The British Championship is theplace to see the best British competitors taking each other on in the original extreme sport. But who are the ones to watch in the 2018 Championship? The heat will most certainly be on this year – those who perform well have the prospect of earning a place in the World Championship on the horizon. With the World Championship taking place in Britain for the first time ever in 2018, we expect the action to be intense. Read on to find out who your money should be on! 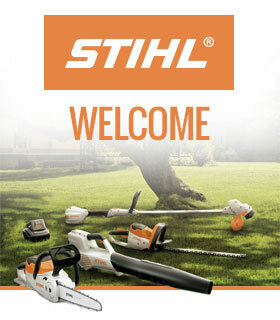 The British Championship takes place on Saturday 4 August in the STIHL Arena at Countryfile Live with 15 athletes fighting it out to be crowned the British champion. Each athlete will compete in the six different TIMBERSPORTS®disciplines and earn points depending on how quickly they complete each one. The overall winner will be the athlete who accumulates the most points over the course of the event, similar to how a decathlon works. The man who has won three Championships in a row cannot be ignored at the 2018 event. 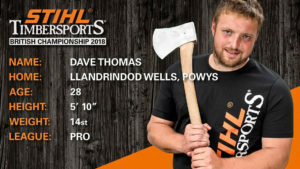 The 36-year-old from Bala in Wales takes his TIMBERSPORTS®very seriously, training and competing most weekends throughout the year. As a result, he always delivers a solid performance, although it came down to the wire in 2017, when he beat his two closest rivals, Simon Bond and Glen Penlington by only the smallest of margins. Could this be the year that someone beats him? 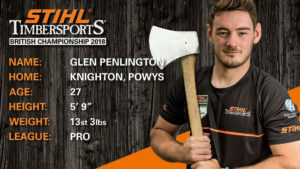 Glen also hails from Wales, and, as part of the Welsh Axemen, he spends a lot of his spare time competing and doing demos at county shows around the country. At 5ft 9 inches tall, Glen is one of the shorter competitors but that low centre of gravity (plus his impressive chopping skills!) could be one of the reasons why the Springboard is his best discipline. Glen holds the British Record in the Springboard after he completed the event in 1:03.83 in 2016. Glen finished 5th that year, but after some intense training, he jumped two places to 3rdin 2017 – can he jump two more places to the top this year? As one of the older competitors in the competition, Andrew could be forgiven for taking it easy! 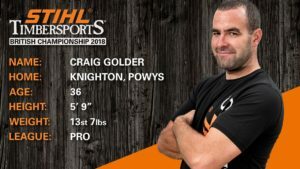 But his experience and knowledge of the best techniques mean that he has finished in the top four in three out of the last four British Championships. 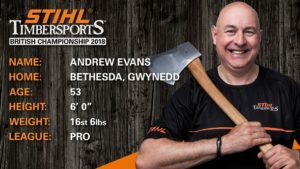 His own advice to anyone thinking about trying TIMBERSPORTS®is to “stick with it as it takes years to master”! Andrew clearly pays attention to this himself by training on a regular basis, with the Single Buck his strongest discipline. 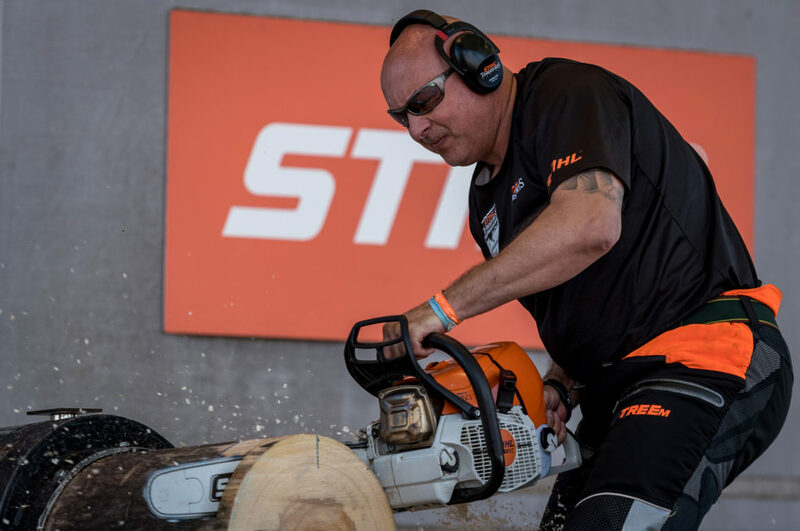 One of the handful of competitors who actually uses a chainsaw in his day job as a tree surgeon, Scott is certainly one to watch in the future. 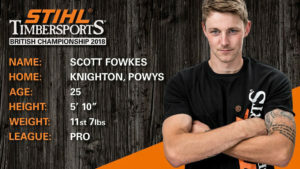 Scott won the British Rookie Championship in 2016, where athletes under 25 complete four of the six disciplines, and successfully took the step up to the next level in 2017. His winning mentality drives him to train hard and he regularly competes in other logger sports competitions. Dave jumped from 11th in 2016 to 8thin 2017 and is pushing himself to improve all the time. 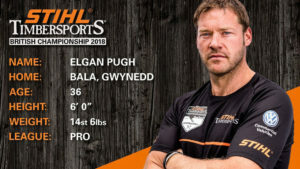 He shaved over two minutes off his total time in 2017 compared to the previous year and has been working on additional training with British TIMBERSPORTS®trainer, Spike Milton, this year in a bid to improve on those times again. Craig owns two timber lorries and first got into logger sports when he delivered timber to a local axe club! Craig finished 8th, 7ththen 6th in the last three British Championships respectively and says the Standing Block Chop is his favourite discipline, whereas the technical nature of the Springboard means it is the one he finds most difficult. He’ll be focussed on improving again for the fourth year running. One thing is for sure – with the chance of qualifying to represent Great Britain in either the team or individual events at the World Championship in Liverpool in October, the competition could be wide open this year! In this extreme sport, anything can happen and when events are completed in seconds, all it takes to slow a competitor down and cost them the Championship is a small knot in the log, or a minor mistake. If you want to see this battle to be the best up close, tickets are still available for BBC Countryfile Live so get yours today. Who is your favourite for the British Championship? Share your tips for the top in the comments below.